Size matters. You know it, and Westin knows it. That's why Westin didn't go tiny when designing their stainless Pro Traxx 5" wheel to wheel nerf bars. With the huge five inch width you will always have a nice step up in to your truck's cab or bed. Along with their impressive width, you're Westin stainless Pro Traxx 5" wheel to wheel nerf bars are designed to go the distance. Plus you're Pro Traxx come with a 30 degree bends and a seamless domed ends for that truly finished look. Mounting these nerf bars are a snap as well, featuring customer bolt-on brackets and nerf bars. That's great news if you aren't excited by the thought of putting holes in your truck. You can't go wrong ordering a set of Westin stainless Pro Traxx 5" wheel to wheel nerf bars. These heavy-duty side steps will deliver the performance and lifespan that demanding truck owners expect. 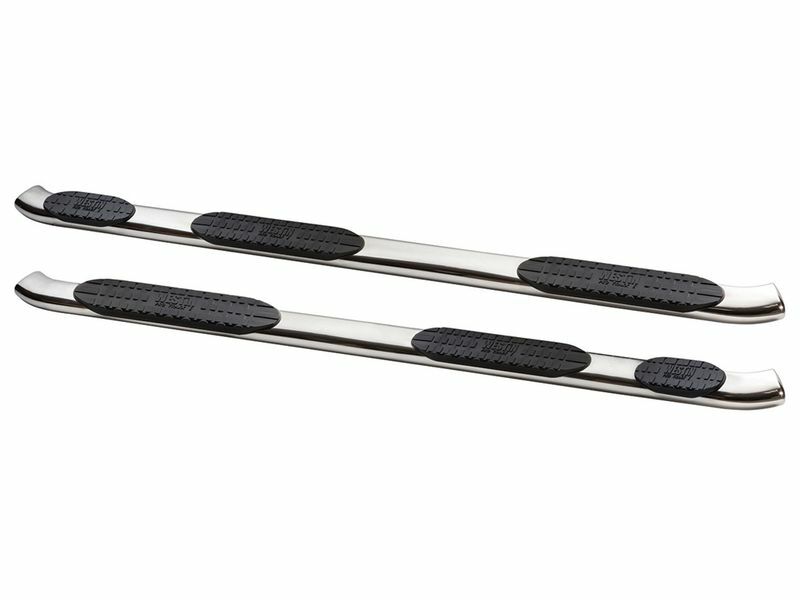 Westin stainless Pro Traxx 5" wheel to wheel nerf bars come with an amazing limited lifetime warranty. If you have any questions please give out amazing customer service a call. The Westin stainless Pro Traxx 5" wheel to wheel nerf are vehicle specific for easy installation. All the hardware comes with and easy to read instructions. If you have any questions, don't hesitate to give our friendly customer loyalty specialists a call.